For decades, no girl child was allowed to be born. They were mostly killed at birth. 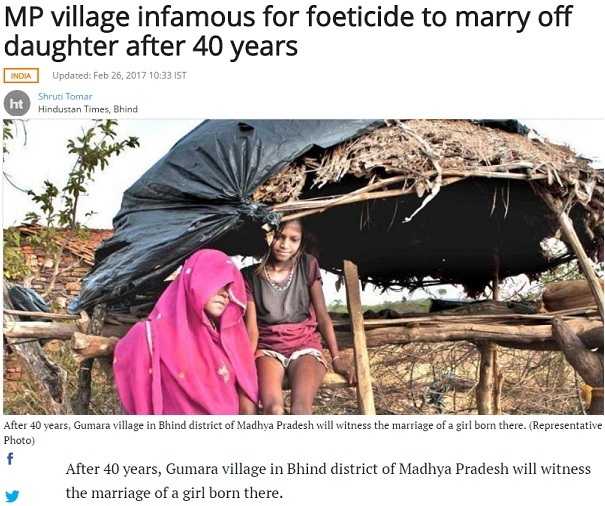 Finally, after 40 years, a girl born here is getting married. While it's a welcome news, it also shows how rampant has been the killing of girl child in India. This report tells us that villagers did not allow a girl child to survive. A conspiracy of silence ensured no one complained to authorities, as every family was guilty, reports Shruti Tomar. The situation started changing slightly after 2005. However, villagers are touchy about the subject. The girl Arti Gurjar is getting married this year. People are excited as many never saw a girl's marriage and the rituals here. Such was the situation in Gumara that villagers didn’t allow any pregnant lady to come in contact with a woman who had given birth to a girl child. The women in this village were scared of chuna (lime), milk and tobacco while delivering a baby, because if a girl child was born, these items were used to kill her. "I gave birth to a girl child 20 years ago, the family members didn’t dare to kill the girl child, but they forced me not to provide any food and care to her. My daughter died of starvation", says a woman. Tens of thousand of students may not be able to appear in NEET. Those who are facing this strange situation are students of Urdu medium. While NEET is conducted in ten languages and even though very few students appear through these languages, they are included. Recently, two languages were added but Urdu has not been included. The CBSE conducts the examination for admission in Medical colleges. 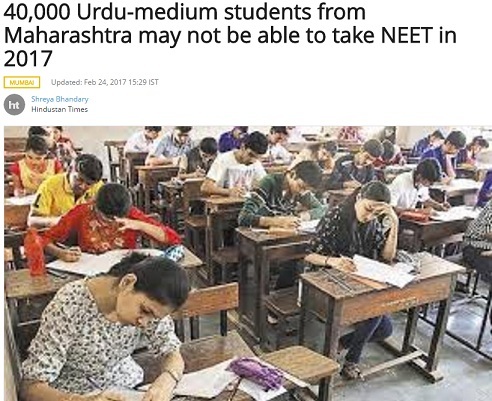 Around 50,000 Urdu medium students from different states are supposed to appear in NEET. Surprisingly, CBSE hasn't shown any concern towards these students. Shouldn't our ministers show concern for these students? While the case is in the court and hence it may take some more time, shouldn't the government realize the students' difficulties. The discrimination is costing students their future. We request the CBSE to stop being rigid and allow Urdu medium students to appear. Hope, ministers will understand the gravity of the situation. Apart from Maharashtra, students from Karnataka, Telangana and some other states have also studied in school [junior college] in Urdu medium and for them it is a big shock that Urdu medium has been excluded. The CBSE is condcuting the examination in Hindi, English apart from Tamil, Telugu, Gujarati, Oriya, Marathi, Kannada, Assamese and Bangla. The option of Urdu is not being kept despite substantial number of students. The petition in the court has sought that ministry of health and family welfare & CBSE be asked to allow Urdu too and students who want question paper in Urdu, must get it. We urge Honorable Ministers Mr JP Nadda and Mr Prakash Javdekar to redress it, and include Urdu in NEET. Hope Honourable ministers Mukhtar Abbas Naqvi, MJ Akbar will intervene and speak to ministers concerned and resolve the issue. It was repeatedly being said that AIMIM's entry would hurt Muslim representation as the community's votes would further be divided. 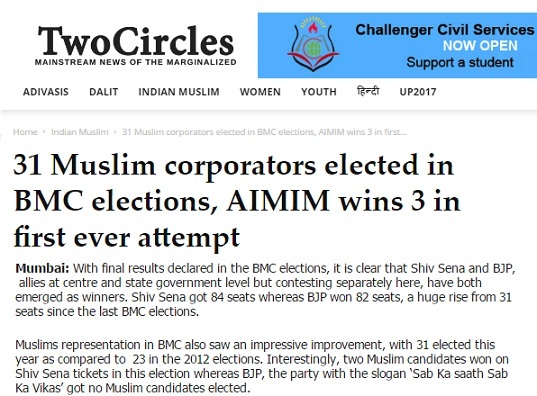 But, on the contrary, the representation of Muslims has gone up in a big way in Brihanmumbai Municipal Corporation (BMC), the results of which have been announced. 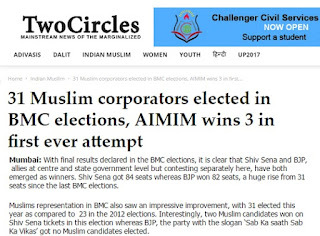 There were 23 Muslim corporators in BMC in the last corporation. After AIMIM's entry, the figure has gone up to 28. 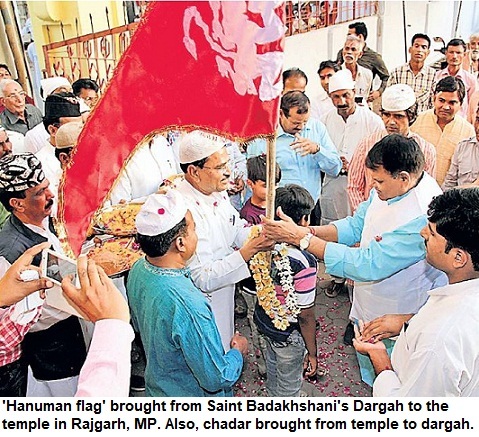 That's a sharp increase in Muslim presence in the corporation in India's biggest city. Some news reports said that 31 Muslims won LINK. However, the figure seems to be 28, now. Muslim population in Mumbai is nearly 19%. The representation was earlier 10%. Now, it has gone up to 12.3%. Surprisingly, even Shiv Sena's two Muslim candidates won the election. Congress and NCP have fared badly. Yet, it is their Muslim candidates who had far better winning rate. 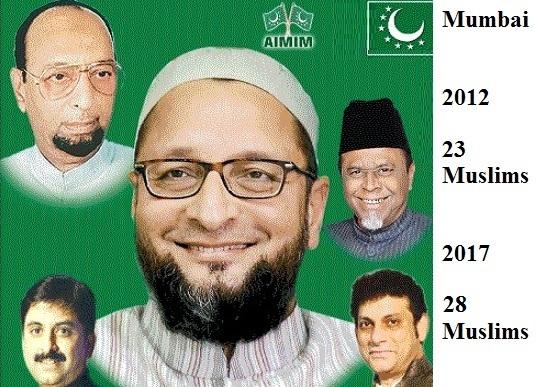 MIM could win just three seats though it performed much better in Amravati and Solapur civic bodies. Clearly, the myth about split in votes that had kept Muslims worried for years, has been broken--at least in Mumbai. In fact, the results again show that Congress and other parties were not giving adequate tickets to Muslims, and were unable to even shift their non-Muslim votes for Muslim candidates. TV channel Zee News is facing flak from Muslim groups for regularly inviting Tarek Fatah, a Pakistani-Canadian who is critical of Islam and Muslims. Rashtriya Ulama Council (RUC), a UP-based political outfit has now made a formal complaint to the Election Commission of India (ECI). Terming him as an instrument of agencies who want to sow seeds of communal discord in the society and spreading hate among religious communities, the RUC has urged ECI to ban 'Fatah Ka Fatwa' programme. "Just when five states are going to polls, the programme where Fatah insults Islamic figures, consistently targets Islam, tries to provoke people and uses inflammatory language, is being aired". "The programme Fateh Ka Fatwa should be stopped in national interest", says RUC. "It seems a conspiracy that Fatah would be allowed to air his inflammatory comments on a regular basis. These comments hurt crores of people, also poison the minds of rest of the society and lead to communal disharmony", the representation reads. "Freedom of expression doesn't mean freedom to hurt sentiments and such statements that intend to divide the society on communal lines. It is a clear attempt to polarize voters on the eve of the crucial state assembly elections", the RUC has said. What makes Tarek Fatah a favourite for right-wing in India? Though a Pakistani, Fateh has been living in Canada. He has earlier said that he wished to see India divided. Yet, right-wing seems to be in love with him. The reason is apparently his diatribe against Islam and Muslims. Of late, a campaign has also begun on social media--to unsubscribe Zee News and write to Asian Paints that sponsors the 'Fatah Ka Fatwa' programme. For example, see this petition addressed to KBS Anand, the managing director and CEO of Asian Paints, urging him to stop sponsoring the programme. There are several other campaigns on social media, against Zee News and Tarek Fatah, these days. Hindi daily Dainik Bhaskar is facing criticism for its promotional campaign. Just when UP elections are round the corner, it has come up with these hoardings. Member of Parliament (MP) Dr Misa Bharti has also objected to it, in her tweet. 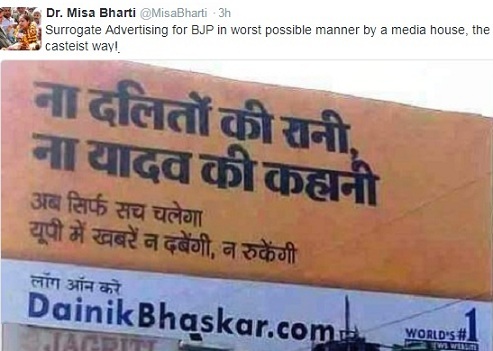 She wrote, 'Surrogate advertising for BJP in worst possible manner by a media house, the casteist way!'. The hoardings target two leaders, two caste groups and two parties. Hence, there is outrage. There is no mention of BJP that is also an important party in UP. Hence, there has been a visible anger. Akhilesh Yadav's Samajwadi Party and BSP's Mayawati are being attacked here. It is like Dainik Bhaskar would bring the change, and you will no longer hear or read about these politicians! Is Bhaskar contesting election or it wants to drop covering SP-BSP. The same group, Dainik Bhaskar, had got CM Akhilesh Yadav to inaugurate the Bhaskar website? The hidden biases are very clear, when BJP is not even named. The hoardings don't at all talk about BJP's communal campaigns for years--from the era of Temple movement till recent communal speeches of its leaders, or from its numerous efforts to stoke communal passions, right from Kashi to Kairana in recent years. Dainik Bhaskar is not known for fair journalism. For years, it has played the role of 'judge, jury and executioner'. Though it claims to have highest circulation among newspapers [Jagran also makes similar claim], it has very low credibility. For those who can't read Hindi script, one of the hoarding says, 'Na Daliton ki Rani, Na Yadav ki kahani'. The other billboard has the line, 'Na Maya ka jaal, Na Akhilesh ka klesh'. There have been protests against these advertisements, complaint to DM, Election Commission and complaint to police too.